Where Will You Stay During Your Visit? Some towns and hotels book up early; others have more or fewer local amenities. 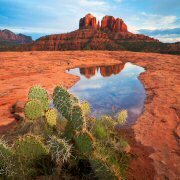 With great scenery and tourist attractions, Sedona is the high-end "Aspen, Colorado" of Arizona. Of the gateway cities, Sedona is farthest from Grand Canyon, about two hours. However, it is truly among the most beautiful cities in America. Epic scenery and hiking. World class shopping. Warmer temps. 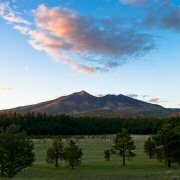 Flagstaff is our largest nearby city, with a University, NAU. Amenities are correspondingly diverse, including many hotels, restaurants, and cultural activities. Flag is about 1.25 hours from Grand Canyon. 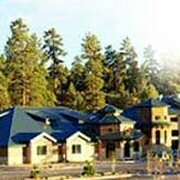 A beautiful city surrounded by ponderosa pine forests, many trails, and the highest mountain in Arizona. Williams is tiny and has beautiful lakes and cheaper (but very nice) hotels and B&B's. There are a few good restaurants, too. It is about 45 minutes from the Canyon. You might enjoy the many small-town events, like the funny cowboy shoot-outs each summer evening. 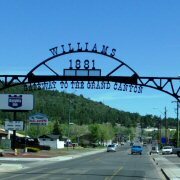 Williams is a famous old Route 66 stop. Grand Canyon has limited hotel space both inside and outside the park. Inside hotels are all run by Xanterra, the Grand Canyon consessionaire, accustomed to huge, busy crowds, rustic hotels, and spotty service. Outside hotels are 15 minutes from the rim, and more modern. Book six months to a year in advance. Use these city and town descriptions to decide where to stay. Sedona probably has the best scenery and tourist activities. Flagstaff is the largest city and has a university. Williams is tiny and has beautiful lakes and cheap hotels. Grand Canyon has hotels inside and outside the park. You can also choose a local campground or RV park.